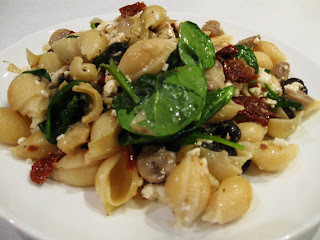 Olives, mushrooms, artichokes, sundried tomatoes, feta....doesn't this sound like a nice mix! My mouth is watering thinking about it. This recipe of mine is tried and true. It's so easy and tasty. Great to make when you don't feel like making a huge effort with your meal but want impressive flavours. I'm also sharing this with PRESTO PASTA NIGHTS and hope more of you can also join into this great pasta exeprience! Just click on the link to find out more. - Mix all ingredients together (including pasta, but only 3/4 of the feta) in an oven proof dish. This is my kind of pasta dish! Why don't you enter it into Presto Pasta. Everyone would love it and you just have to add to the post that you are submitting it and add a link! Ruth would be really pleased as it is here 100th edition and has to be in by Thursday. There is a new logo you can add too http://ff.im/-ZGqi. "Please post your recipes on your blog, mention and link to Presto Pasta Nights . If you don't have a blog - no worries - email your favorite pasta recipe to me directly and I'll post them on Once Upon a Feast and add them to the roundup....Oh...and as if that's not enough of a request...Spread the word - tell all your friends to do the same. Email: ruth (at) 4everykitchen (dot) com"
Holler, thanks for suggesting Presto Pasta Nights. And Sarah, thanks for an aweseome recipe. Given how cold it is here, your dish is a perfect instant transporter to warmer climes. Hi! Nice to find your blog. Love the pasta dish. I made one with similar components this week that was delicious! I found your dish over at Presto Pasta Nights. It looks delicious. Ruth - thanks for your kind words and for inventing Presto Pasta! There were so many good ones last week! Psychrad - Thanks for visiting. Yeah, I love most Med ingredients! What did you put in your dish? This looks great! I love pasta bakes - so tasty and easy to throw together!